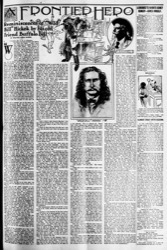 Reminiscences of "Wild Bill" Hickok by his old Friend Buffalo Bill . . . .
"WILD BILL was the greatest gun fighter the west ever knew. I don't know how many men he killed, but it was more than thirty. That number is exclusive of the men he killed in the Civil war. He is credited as a sharpshooter with having killed 35 men, including the Confederate General McCullough, in the battle of Pea Ridge alone. I don't know how true that is. It is impossible for anyone to tell how many men he kills in a battle when thousands of men are firing. But he killed more than thirty in personal encounters. He killed ten in one fight single handed. That was when he wiped out the McCandlass  gang at Rock Springs, Kan., in 1861, and it was the most heroic single-handed fight in all the history of the frontier. Imagination has not colored or enlarged his record. It is a sure-enough record of men killed in fair, stand-up fights. If one cares to search, one can find their graves with their names neatly carved on little headstones scattered from the Missouri river to the foothills of the Rockies." Col. Willian F. Cody, better known all over the world as Buffalo Bill, was in reminiscent mood. He paid this tribute to the prowess of his dead comrade of early days on the plains. He was intimately associated with Wild Bill. He fought by his side in the Civil war, he scouted with him in the Indian campaigns, he shared the same blanket beside many a lonely camp fire. For years there was a bed and a chair and the table for Wild Bill at the ranch of Buffalo Bill's mother near Fort Leavenworth, and to the very end of his stormy and wandering career Wild Bill thought of this spot as home. Buffalo Bill is himself one of the most picturesque characters of the old west left to these piping, prosaic times. Though the public knows him chiefly as a showman, he is the last of the great scouts. His life has not been all blank cartridges and calcium lights. Back of his spectacular career as an exponent of wild west drama is a frontier life of daring, hardship and danger. He is an old man now, only a few years on the sunny side of three score and ten. His sweeping mustaches and imperial and his long hair that falls upon his shoulders in the waving abundance of early years are as white as snow. But his tall figure is still stalwart and as straight as a young pine on the mountains, his step is elastic and his eye bright, and he still wears his white sombrero tilted at a jaunty angle on the side of his head as in the brave days of his youth. "My unexpected champion was about twenty years old, tall, slender, bronzed and athletic looking. The powerful brute he confronted would have made two of him. The bully stopped in surprise. He sized up the stripling with a glance. The inventory doubtless convinced him he had nothing to fear. "'What have you got to do with this?' he bellowed and he charged at the youth like a mad bull. 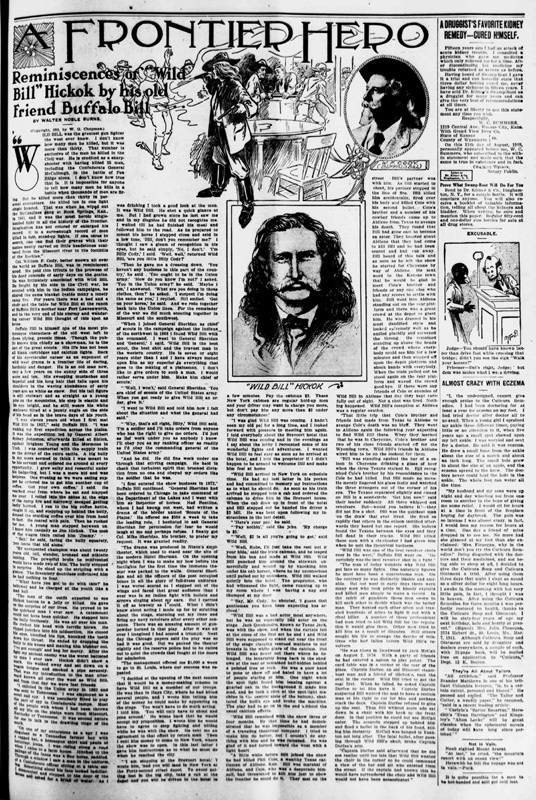 "The men of the outfit expected to see Hickok beaten to a jelly or killed. He gave us the surprise of our lives. He proved to be the quickest man I ever saw. A catamount could not have been quicker. He stepped into the bully fearlessly. He was all over his man. He rocked his head with terrific blows. He ripped punches into his midsection. He closed his eyes, bloodied his lips, knocked the teeth down his throat. He ended by dropping the bully to his knees and making him blubber out, 'I've got enough' and beg for mercy. After the fight my ancient enemy was the worst battered up man I ever saw. Hickok didn't show a mark. He walked away and sat down on a wagon tongue and smoked a pipe serenely. That was my introduction to the man afterward known all over the west as Wild Bill, and from that day we were fast friends. "I enlisted in the Union army in 1863 and was sent to Tennessee. I was employed as a scout and spy. I was peculiarly fitted to play the part of spy in Confederate camps. Most of the people with whom I had been thrown all my life on the plains were from Missouri, Kentucky or Tennessee. It was second nature for me to talk in the drawing lingo of the south. "Then he gave me a dressing down. 'You haven't any business in this part of the country,' he said. 'You ought to be in the Union army.' 'How do you know I'm not?' I asked. 'You in the Union army?' he said. 'Maybe I am,' I answered. 'What are you doing in those clothes, then?' he asked. 'I suspect I'm doing the same as you,' I replied. Bill smiled. 'Get on your horse,' he said. And we rode together back into the Union lines. For the remainder of the war we did much scouting together in Missouri and the southwest. "I went to Wild Bill and told him how I felt about the situation and what the general had said." "And he did. He did fine work under me through that stirring campaign. He held in check that turbulent spirit that brooked dictation from no one and obeyed my orders like the soldier that he was. "I first entered the show business in 1872," Buffalo Bill continued. "General Sheridan had been ordered to Chicago to take command of the Department of the Lakes and I went with him as inspector of horses. Ned Buntline, whom I had known out west, had written a drama of the border named 'Scouts of the Plains.' He offered me $500 a week to take the leading role. I hesitated to ask General Sheridan for permission for fear he would laugh at me and perhaps refuse. I finally got Col. Mike Sheridan, his brother, to prefer my request. It was granted readily. "The drama was produced in Nixon's ampitheater, which used to stand near the site of the modern Hotel Sherman. On the opening night when I was to make my bow before the footlights for the first time the immense theater was packed to the walls. General Sheridan and all the officers of the post occupied boxes in all the glory of full-dress uniforms I was worse scared as I stepped out of the wings and faced that great audience than I ever was in an Indian fight with bullets and arrows singing about my ears. But I carried it off as bravely as I could. What I didn't know about acting I made up for by strutting about the stage, storming out my lines and firing my navy revolvers after every other sentence. There was an amazing amount of gunpowder burned in that play. After it was all over I imagined I had scored a triumph. Next day the Chicago papers said the play was so bad it was good. But we packed the theater nightly and the reserve police had to be called out to quiet the crowds that fought at the doors for admission. "The management offered me $1,000 a week to go to St. Louis, where our success was repeated. "I decided at the opening of the next season that it would be a money-making scheme to have Wild Bill as a member of our troupe. He was then in Hays City, where he had killed several people, and I wrote to him telling him of the money he could make by appearing on the stage. 'You won't have to do much acting, I told him. 'You will only have to shoot and pose around.' He wrote back that he would accept my proposition. I wrote him he would have to agree to stop fighting and killing while he was with the show. He sent me an agreement to that effect by return mail. Then I sent him money to come to New York, where the show was to open. In this last letter I gave him instructions as to what he must do when he reached the city. "I was glad Wild Bill was coming. I hadn't seen my old pal for a long time, and I looked forward with pleasure to meeting him again. I told everybody about the Brevoort hotel that Wild Bill was coming and in the evenings as I sat about the lobby I recounted some of his wonderful fights and adventures. I wanted Wild Bill to feel easy as soon as he arrived at the hotel, and I told the proprietor if I didn't happen to be around to welcome Bill and make him feel at home. "Wild Bill arrived in New York on schedule time. He had my last letter in his pocket and had committed to memory my instructions as to what he should do. As soon as his train arrived he stepped into a cab and ordered the cabman to drive him to the Brevoort house. When the cab drew up in front of the hotel and Bill stepped out he handed the driver a $2 bill. He was bent upon following my instructions to the last detail. "'Here's your pay,' he said. "'Well, $2 is all you're going to get,' said Wild Bill. "'Well, Rube, I'll just take the rest out o' your hide,' said the irate cabman, and he leaped from his box and made at Wild Bill. Wild Bill punched him around the sidewalk unmercifully and wound up by knocking him under his cab horses, where he lay unconscious until pulled out by onlookers. Wild Bill walked quietly into the hotel. The proprietor, who had witnessed the fight, came running up to my room where I was having a nap and thumped at my door. "Wild Bill was a bad actor most anywhere, but he was an especially bad actor on the stage. Jack Omohundro, known as Texas Jack, was with the show, and when the curtain fell at the close of the first act he and I and Wild Bill were supposed to stand out near the front of the stage clasping rescued maidens to our breasts in the white glare of the calcium. But Wild Bill was never out there where he belonged. He invariably hung back in the shadows at the rear or remained half-hidden behind a painted tree or rock. He was a poor hand to pose or show off and hated to have a lot of people staring at him. One night when the spot light found him leaning against a gnarled oak in the background it made him mad, and he took a shot at the spot-light machine in the central aisle of the balcony, shattered the bull's eye and broke the machine. The play had to go on to the end without the usual calcium effects. "Wild Bill remained with the show three or four months. By that time he had demonstrated that he was impossible as a member of a traveling theatrical company. I tried to make him do better, but I couldn't do anything with him and he was released. He was glad of it and turned toward the west with a light heart. "A little while before Bill joined the show he had killed Phil Cole, a wealthy Texas cattleman of Abilene, Kan. Bill was marshal of Abilene, and Cole, who was a desperado himself, had threatened to kill him just to show the frontier he could do it. They met on the  W. F. CODY. (BUFFALO BILL) street. Bill's partner was with him. As Bill started to shoot, his partner stepped in the line of fire. Bill killed him accidentally, fired over his body and killed Cole with his second bullet. Cole's brother and a number of his cowboy friends came up to Abilene from Texas to avenge his death. They found that Bill had gone east to become an actor. They boasted about Abilene that they had come to kill Bill and he had been scared and had run away. Bill heard of this talk and as soon as he left the show he started to Cheyenne by way of Abilene. He sent word to the Kansas town that he would be glad to meet Cole's brother and friends or any one else who had any scores to settle with him. Bill went into Abilene standing out on the rear platform and there was a great crowd at the depot to greet him. He was dressed in his most dandified style and looked extremely well as he smiled placidly and surveyed the throng. He remained standing up above the heads of the crowd where everybody could see him for a few minutes and then stepped off upon the depot platform and shook hands with everybody. When the train pulled out he stood again on the rear platform and waved the crowd good-bye. If there were any friends of Cole or enemies of Wild Bill in Abilene that day they kept carefully out of sight. Not a shot was fired. Nothing happened. Wild Bill's reception at Abilene was a regular ovation. "That little trip that Cole's brother and friends had made from Texas to Abilene to avenge Cole's death was no bluff. They went to Abilene again the following year expecting to find Wild Bill there. Whey they learned that he was in Cheyenne, Cole's brother and two of his close friends started off for the Wyoming town. Wild Bill's friends in Abilene wired him to be on the lookout for them. "Bill was standing against the bar of a saloon in Cheyenne drinking a glass of beer when the three Texans stalked in. Bill recognized Cole's brother by his resemblance to the Cole he had killed. But Bill made no move. He merely fingered his glass lazily and watched the three strangers out of the corner of his eye. The Texans separated slightly and closed on Bill in a semi-circle. 'Get him now!' said their leader suddenly. All three whipped out revolvers. But—would you believe it?—they did not fire a shot. Bill was the quickest man 'on the draw' that ever lived. He fired so rapidly that others in the saloon testified afterwards they heard but one report. His bullets found the Texans between the eyes and they fell dead in their tracks. Wild Bill killed these men with a six-shooter I had given him when he quit the theatrical business. "Wild Bill was one of the best revolver shots ever in the west," Buffalo Bill went on. "He certainly was the best revolver shot in a fight." "The man of today wonders why Wild Bill got into so many fights. One naturally figures he must have been a quarrelsome man. On the contrary he was distinctly likeable and amiable. But out west in early days there were many men who took pride in bloody exploits and killed men simply to make a record. In the spirit of gamblers these men swore to kill each other to decide which was the better man. They hunted each other often and traveled hundreds of miles to fight it out with a rival killer. A number of these professional bad men tried to kill Wild Bill for the reputation it would give them. Other men tried to kill him as a result of disputes. Still others sought his life to avenge the deaths of relatives who had fallen before Wild Bill's revolvers. "He was killed in Deadwood by Jack McCall on August 2, 1876. With a party of friends he had entered a saloon to play poker. The card table was in a corner at the rear of the place. Captain Durfee, an old Missouri steamboat man and a friend of Hickok's, took the seat in the corner. Wild Bill tried to get the seat first. When he failed, he asked Captain Durfee to let him have it. Captain Durfee suspected Bill wanted the seat to have a certain man at his right to cut for him and perhaps stack the deck. Captain Durfee refused to give up the seat. Then Bill without more ado sat down in a chair with this back to the front door. In that position he could not see McCall enter. The assassin stepped up behind him and fired a bullet in the back of his head, killing him instantly. McCall was hanged in Yankton not long after. The fatal bullet, after passing through Wild Bill's skull, broke Captain Durfee's arm. "Captain Durfee said afterward that he did not realize until too late that Wild Bill wanted the chair in the corner so he could command a view of the bar and all who entered from the street. If the captain had known this he would have surrendered the chair and Wild Bill would not have been assassinated."